With the release of MHAG Desktop 2.1, I am free to work on MH3G support. 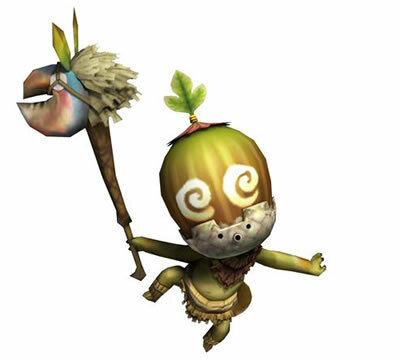 I plan to make a MH3G version with english translation and original japanese names. If MH3G comes to the west, all translations will be converted to the official data. And most important one: MH3G Armors coming next. MHAG Desktop 2.1 was finally released today! This version should have been done long time ago, but I kept adding some more features. >.> I added almost all features users requested. Most importantly, the new version is ready for G-Rank data now. So I can work on MH3G or MHFU at any time in the future. This is the download link! 1. new look and feel. 2. new feature: Now all games are integrated into a single package. Users can choose a game at the beginning. All user data are saved in sub-dir. 4. new feature: Add the option to display armor/charm materials in the calculator. Data is extracted from the open source project TriDB (thanks to Feox for convert the data to MHAG format) and P3DB (Most armor/charm names were synchronized with mhf3.com). 5. new feature: Enhance keyboard controls. Most comboboxes now has auto-completion function. "enter" key can trigger button. 6. new feature: Adjust female/male checkbox. Now if male/female is selected, only male/female sets are available in the armor selection menu. (mostly for mp3rd and future games) The generator also search sets only for specific gender. 7. error: The Boss' Set and Snake's Set have different skills (mhp3rd). Fixed, sets are now separated. How to run MHAG/upgrade from previous version? Welcome to the first part of my Startup Guide for armor sets and good beginning weapon choices early on. In this first video, I will be going over sets for players that only have access to low rank quests (1-4 star village quests) and what are some sets they should try to get early on. This set will cover players that are just starting out, those that have already had experience, (recommended for players HR 100 or below, and for those who are not 100% confident about their knowledge of monster's attacks) and finally for the best players who are very knowledgeable about monster movements, habits, and when to effectively use bombs and traps. With that being said, here is part 1 of my early game armor set recommendations. Hello everyone, I've been recently "promoted" to author here (thank you Tifa for adding me and for pointing out this blog to me), so I thought I'd start things off with my Lance Mix Sets videos. The purpose of these videos (I will do all weapons when I have the time) is to demonstrate sample sets for any large monster in the game and they are meant to work very efficiently against said monster. These sets are based solely on the skills which the armor set will have, and not on defense, resistance, or looks. I currently have 2 projects I have plans to work on, first being a Start-up Set Path (What sets to go for early on, and the best sets to use when you don't have access to the best armors. [As requested by Vion]) for newbies. My second project is to finish the mix sets for all large monsters for all weapons, and if I still play Tri after that, I will then just add miscellaneous sets that didn't make the cut. I hope you all enjoyed and I hope to be working more with you all in the future! We are aware that some people complain MHAG calculator allows impossible talisman. We adopted the current method because of the new talisman rules for MHP3rd. It does allow impossible talisman. But our admin will help to keep the database clean and accurate. To maintain the high quality of MHAG database, our admins moderate entries according to the following rules. 1. Sets with impossible talisman (or combination) will be removed, unless it can be easily fixed with a correct talisman. 2. Sets with large portion of wasted skill points will be removed, unless the owner specify their reason to keep it. 3. Redundant entries, if posted at the same time or by the same author, will be removed. 4. In case a set can be easily improved (for example, use less weapon slot, or add a charm), a new entry will be posted to replace the old set (with same owner name and set name). It's our goal to keep MHAG database from impossible sets and useless sets. But we still encourage people to save sets for their daily hunts, even if it's not optimal. I, myself, loves sets that can be easily created, and without rare talisman. But our admins are human beings, so we may make mistakes. To help us moderating sets, users are recommended to do the following. 1. Create an account, so users can manage their sets in the future. Or if not, at least use a specific owner name for each saved entry. 2. Use a detailed set name. Show the purpose of the set, or/and your description. MHAG Online server was available to the public for about three month. So far, we have 378 armor sets for Monster Hunter Tri (Wii), and 211 sets for Monster Hunter Portable 3rd (PSP/PS3). We thank a lot of hunters for their supports to MHAG. Especially the following fans for their big contributions to customized armor sets. Plan is json support this will improve speed for the users far away from UK. I just saw a YouTube video, in which the author used MHAG to show his MH3 customized armor sets for lance. Then I took a close look, and I found he is Predator!!! Oz78 mentioned that Predator loves MHAG a lot, and can even be our speakman. lol Predator, thank you for your support!! I made this video about two month ago for Gondor's mh3 EU podcast. It's an introduction video for Monster Hunter Armor Generator Program. Enjoy! Since last month, I noticed that MHAG Desktop 2.0 started to be noticed by some software download sites. They independently tested MHAG and put it on their websites. MHAG is an useful piece of software that helps you generate armor sets for your Monster Hunter character. This simple and efficient application can easily become a great tool for any Monster Hunter player out there. Are you a fan of the Monster Hunter fantasy role-playing game and you are not decided which armor sets to use on your character? If that is the case, then you will definitely enjoy the MHAG. MHAG, short for Monster Hunter Armor Generator, is a handy piece of software that allows you to generate every possible armor set and combinations and quickly calculate their bonuses for your Monster Hunter character. With the help of this lightweight application you could easily create the best possible armor set for your character so that you could play it at its maximum potential. MHAG comes with three useful features that will help you out in choosing the best possible armor setup that you could get your hands on in the game: the calculator, where you are able to choose every armor part, along with their possible bonuses, and preview your final setup so that you could easily perform any modifications, the generator, which allows you to create the best possible armor sets according to the skills of your character and the viewer which lets you load and add your data from the calculator and export your armor sets either as text or HTML documents. This way, you can quickly share your generated armor sets with your friends and show off your awesome character setup. Furthermore, MHAG offers you both an online and offline version so that you can easily generate your armor sets in any possible situation. In addition, if you want to upload your armor setup to show it to other users from the MHAG community, this easy to use piece of software allows you to do that with just one click. Just press the "copy set link" button and the URL pointing to your build will be copied to the clipboard. 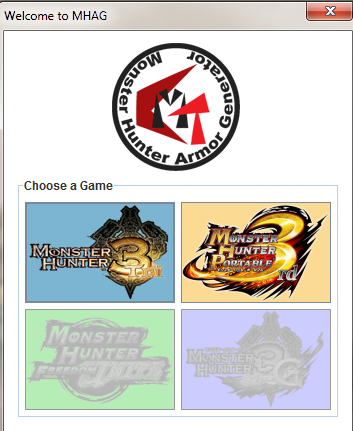 All in all, if you need a handy piece of software that will help you easily generate armor sets for you Monster Hunter character, then you should give MHAG a look. The MHAG Porject was announced on Oct 18, 2011 @ Capcom Unity forums. Here is the copy of the announcement. It can also be found at Monster Hunter Wikia Site. Gondor and I are happy to announce the Monster Hunter Armor Generator (MHAG) Project! MHAG is a FREE armor toolkit, featuring a desktop version (MHAG Desktop) and an online version (MHAG Online). Our developers will post news, our plans, text/video tutorials of our tools and some information about monster hunter here. Stay tuned.